Anopheles gambiae females are the world's most successful vectors of human malaria. However, a fraction of these mosquitoes is refractory to Plasmodium development. L3-5, a laboratory selected refractory strain, encapsulates transforming ookinetes/early oocysts of a wide variety of Plasmodium species. Previous studies on these mosquitoes showed that one major (Pen1) and two minor (Pen2, Pen3) autosomal dominant quantitative trait loci (QTLs) control the melanotic encapsulation response against P. cynomolgi B, a simian malaria originating in Malaysia. We have investigated the response of L3-5 to infection with P. cynomolgi Ceylon, a different but related parasite species, in crosses with the susceptible strain 4Arr. Refractoriness to this parasite is incompletely recessive. Infection and genotyping of F2 intercross females at genome-spanning microsatellite loci revealed that 3 autosomal QTLs control encapsulation of this species. Two loci map to the regions containing Pen2 and Pen3. The novel QTL maps to chromosome 3R, probably to polytene division 32 or 33. Thus the relative contribution of any QTL to oocyst encapsulation varies with the species of parasite. Further, different QTLs were most readily identified in different F2 families. This, like the F1 data, suggests that L3-5 is not genetically homogeneous and that somewhat different pathways may be used to achieve an encapsulation response. We have shown here that different QTLs are involved in responses against different Plasmodium parasites. Melanotic encapsulation of invading parasites and parasitoids is a widespread insect defense mechanism [1–4]. Depending on the insect and the parasite involved, this can be either a cellular or a humoral process. The humoral form of melanotic encapsulation occurs primarily, if not exclusively in the order Diptera, and is correlated with low numbers of circulating hemocytes. Melanotic encapsulation of malaria parasites was first observed within a year of the discovery that mosquitoes are the vectors of malaria . Since then, melanotic encapsulation of plasmodia has been observed in a wide variety of mosquito species. Depending on the mosquito and the parasite species, encapsulation is directed against different stages of development . Anopheles gambiae is the principal vector for human malaria in Africa. A laboratory-selected strain derived from the G3 colony of A. gambiae was found to deposit melanin capsules around transforming ookinetes or very early oocysts of a variety of Plasmodium species [7–10]. Since hemocytes do not appear to participate in formation of these capsules, the mechanism underlying encapsulation is likely to be humoral and/or to involve the midgut epithelium or its basal lamina. One locus, Pif-B, was postulated to control encapsulation of P. cynomolgi B. Comparisons between mosquitoes from this original refractory strain and a counter-selected susceptible strain showed that refractoriness was highly correlated with the 2L+ a chromosomal arrangement and esterase A. Susceptibility was correlated with inversion 2La and esterase C. A similar correlation was found for the parental G3 colony. Thus it was suggested that Pif-B and the esterase A/C polymorphism are located within or very close to the 2La region (divisions 23–26 of ovarian nurse cell polytene chromosome 2L) [11–13]. Genetic mapping experiments with the current refractory (L3-5) and susceptible strains (4Arr) revealed three QTLs controlling the encapsulation of P. cynomolgi B. These loci were named Pen1-3 for P lasmodium en capsulation 1, 2 and 3. Pen1 is the major QTL whereas Pen2 and Pen3 are minor QTLs. The refractory alleles at these loci are largely dominant and the contributions of Pen1 and Pen2 to the encapsulation response appeared additive . The Pen1 QTL is also the major QTL for encapsulation of P. berghei and for melanin deposition on Sephadex-CM C-25 beads . Pen1 has been mapped to chromosome 2R, division 8C/D , while Pen2 and Pen3 locations remain less precisely defined, on distal chromosome 3L in or near division 43, and on proximal chromosome 2R, possibly in division 14, respectively [17, 18]. None of these loci affects the intensity of Plasmodium infection as measured by number of oocysts on the midgut. Recently, the two loci on chromosome 2L were found to control the P. falciparum infection intensity in natural populations of A. gambiae . In contrast, refractoriness to P. cynomolgi Ceylon in the original refractory strain seemed to be largely but not completely recessive [7, 12]. P. cynomolgi Ceylon was originally described as a Ceylonese subspecies of P. cynomolgi , whereas P. cynomolgi B originated in Malaysia. The two are currently regarded as being different species (W.E. Collins, personal communication) and molecular data support this contention [21, 22]. Genetic mapping suggested that Pif-C, the locus controlling encapsulation of this parasite, assorted independently from the 2La inversion polymorphism, and thus was not linked to the left arm of chromosome 2. However, it was not possible to map this locus further because of the lack of polymorphic markers. More recently, a locus near Diphenol oxidase-A2 (3R; 33B) on the right arm of the chromosome 3 was also suggested to be important in the melanization of P. cynomolgi Ceylon . The refractory allele at this Dox-A2 linked locus seemed to be most highly expressive when the mosquitoes were heavily infected (geometric mean 178.3, average 212.1 ± SD 104.9 oocysts per midgut). It is not clear whether this locus is the same as Pif-C. It is definitely not Pen2. Further, it was suggested that a locus or loci unlinked to Dox-A2, but also likely to be on chromosome 3, was involved in refractoriness at lower infection intensity, (geometric mean 28.3, average 40.6 ± SD32.7 oocysts per midgut), and may have contributed to parasite encapsulation at high infection intensity as well. In this study we have investigated the genetics of the encapsulation response against P. cynomolgi Ceylon in crosses between the extant refractory L3-5 and susceptible 4Arr strains using microsatellite markers spanning the genome and QTL analysis. Infection of parental line mosquitoes showed that L3-5 refractory strain mosquitoes encapsulated P. cynomolgi Ceylon, whereas 4Arr did not (Fig. 1A). In three separate infection experiments on a total of 54 individual L3-5 mosquitoes, the overall infection prevalence was 81.5%. 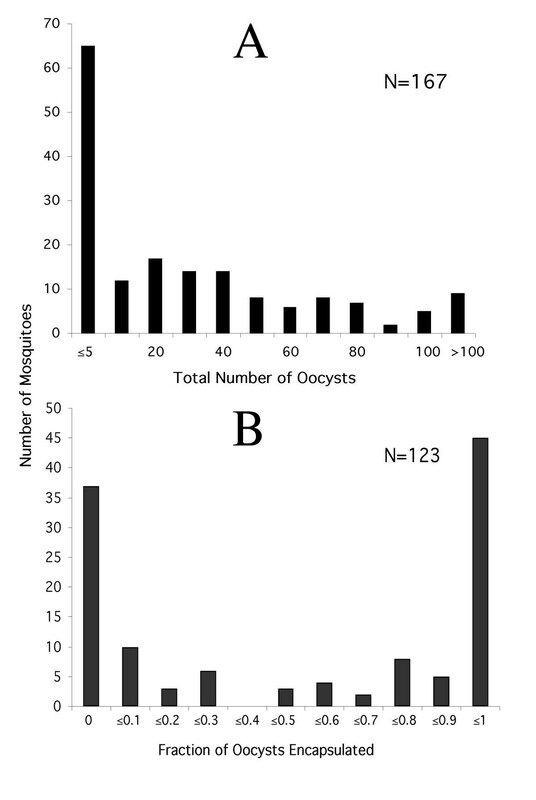 The number of oocysts in infected individuals ranged between 1 and 147. All oocysts were encapsulated. The infection intensities were generally low and quite variable. The average (± standard deviation) of the intensity of infection varied from a low of 4.93 ± 2.62, to a high of 47.80 ± 40.95 between infections. The overall intensity of infection was 26.36 ± 34.09. Melanotic encapsulation of P. cynomolgi Ceylon by A. gambiae. (A) Responses of individual parental L3-5 refractory strain (squares and circles) and 4Arr susceptible strain females (diamonds and triangles) to P. cynomolgi Ceylon infection. Exp.1 and exp. 2 indicate two separate infection experiments. (B) Responses of F1 female progeny from one cross between L3-5 females and 4Arr males (closed diamonds) and three crosses between 4Arr females and L3-5 males (open squares, circles and triangles). In parallel infection experiments on a total of 60 4Arr susceptible strain mosquitoes blood-fed on the same monkeys used to feed the refractory ones, the infection prevalence was 70.0%. Despite the apparent difference in infection prevalence, the overall intensity of infection was very similar to that of the L3-5 females, 21.50 ± 19.66. Further, the lowest and highest infection intensities, 7.00 ± 7.51 and 32.94 ± 23.12 in 4Arr corresponded to the lowest and highest infection intensities for L3-5 that fed on the same monkeys on the same days. Oocyst numbers ranged between 1 and 79. One encapsulated oocyst was found in each of two 4Arr mosquitoes. These data suggest that if there are differences in P. cynomolgi Ceylon infection intensities, they are more likely to be due to the infection parameters of the vertebrate host than to differences intrinsic to the parental mosquito lines. 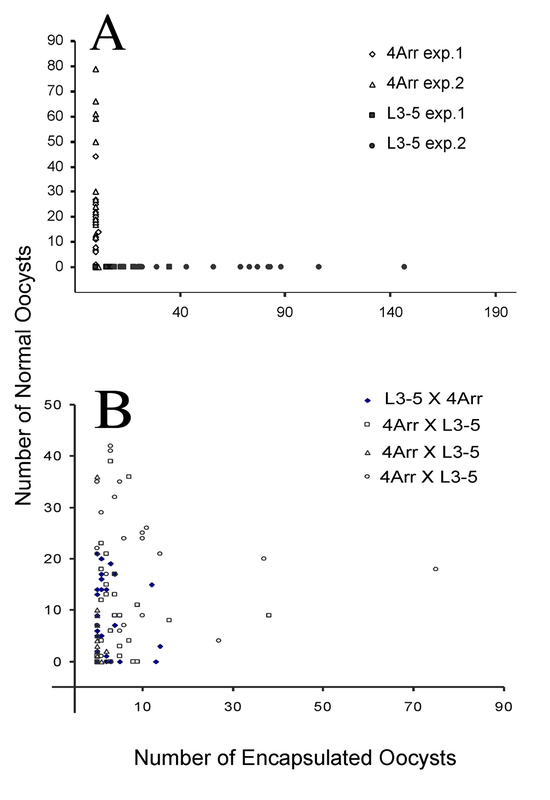 Reciprocal crosses between L3-5 and 4Arr yielded F1 progeny that were mostly susceptible by the criterion they had no or a low fraction of encapsulated oocysts (Fig. 1B). When L3-5 females were mated with 4Arr males, 33 tested F1 progeny had an average of 27% encapsulated oocysts (infection intensity of 12.46 ± 7.31). The reciprocal cross yielded 101 F1 progeny with an average of 39% encapsulated oocysts (infection intensity of 18.33 ± 17.10). Thus refractoriness to P. cynomolgi Ceylon in L3-5 mosquitoes appeared to be largely recessive, but less so than observed in the originally selected strain . Further, these data give no evidence for any maternal effects on the encapsulation response. The encapsulation response of 167 females in six F2 intercross families was tested in three separate feeding experiments (Table 2). Family 8–6 females fed on one infected monkey while females in the other five families fed on a different monkey on two successive days of ascending parasitemia. The infection intensity for the combined F2 progeny was 22.96 ± 36.14. The majority of the F2 progeny were either highly refractory or highly susceptible (Table 2; Figure 2), with 58 (35%) and 47 (28%) individuals exhibiting ≥ 80% or ≤ 20% oocysts encapsulated. 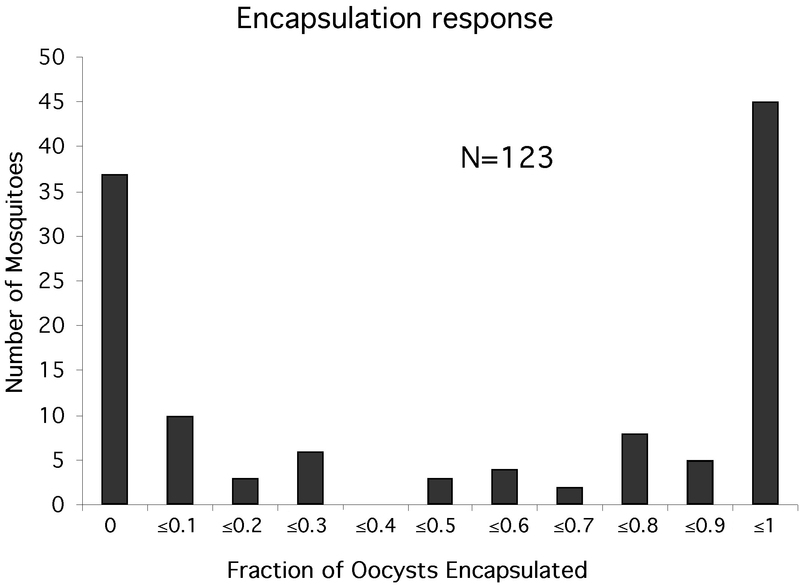 62 (37%) of the females had intermediate fractions of encapsulated oocysts. These data suggest that alleles controlling melanotic encapsulation are segregating at more than one locus. New microsatellite markers and primers developed for this study. The cytogenetic location of H682 is A. gambiae scaffold predicted by it's location in AAAB01008987, contig 566 (GenBank accession AAAB01008987). New primer pairs were designed for markers R007  and H249 . Sequenced allele size is expressed in base pairs (bp). * This Dopa decarboxylase microsatellite is contained within the large first intron of predicted Ddc isoform 1. DNA sequence is from G3 strain (GenBank # AF063021; P. Romans, unpublished). * Fraction of F2 females that became infected. # Number of oocysts in the infected midguts. † Number of parasites per microliter of blood at the time of feeding. P. cynomolgi Ceylon infection phenotypes of F2 female progeny from crosses of six F1 females with their sibling males. (A) Intensity of infection was plotted against the total number of oocysts, both normal and encapsulated, per female midgut. N = 167. (B) Encapsulation responses of 123 infected F2 females. The number of F2 females was plotted against the fraction of oocysts encapsulated per midgut. Genotyping was performed on these 167 female progeny and their six female F1 parents at 52 microsatellite loci spanning the current genetic map of A. gambiae. These included 6, 22, and 24 loci on the X, second and third chromosomes, respectively (see Materials and Methods). Six markers were monomorphic in all families and thus uninformative (H678 on the X; H682 and H117 on the second chromosome; H776, H525, and H544 on the third chromosome). Marker H197 on the second chromosome gave uninterpretable data. Only two alleles were found for each informative marker on the X chromosome. However, among the six F1 female parents of the F2 families, more than two alleles were found at 11 autosomal loci, indicating that one or both of the parental strains was polymorphic at these loci. The H750 locus, which maps to 65.7 centiMorgan (cM) on the third chromosome, had four alleles. Furthermore, the two parental strains also share some common alleles. This is exhibited by the observation that one of the six F1 females (12-1) was homozygous at 10 autosomal loci. In total, 5, 16 and 14 loci were informative on the X, second and the third chromosomes, respectively. Genotypes of the F2 female progeny were tested for deviations from the expected Mendelian ratios at each locus within each family. Although significant deviations were found for some loci, these loci were not clustered in any chromosomal region (data not shown). No QTL was identified for infection intensity in the previous study . Nor did our infection data suggest any genetic variation for infection intensity between L3-5 and 4Arr. We thus focus our attention on the melanotic encapsulation phenotype, which we have expressed as fraction of encapsulated oocysts in a single mosquito. Linear regression analysis was performed for each locus within each family and for all families combined. Considering the combined data, no significant association was found between the oocyst encapsulation phenotype and any marker on the X chromosome (Table 3). This is similar to previous results obtained for P. cynomolgi B and all other parasites tested. Probability of a QTL for P. cynomolgi Ceylon encapsulation on the X chromosome. * Maximum F statistic calculated using all informative data. †Calculated from all informative data. ‡ Average of the maximum F statistics for all informative families. § Probability values P and P' were calculated based on 1000 permutation tests before and after Bonferroni correction respectively. Surprisingly, no major QTL was identified on chromosome 2 near H290 or H175 (Table 4), the markers that most precisely defined Pen1 . Thus it is unlikely that a Pen1 allele has a significant role in the encapsulation of P. cynomolgi Ceylon. 3F11-C1 (2R, 9B) was the only marker near the Pen1 cytogenetic region that might be associated with an encapsulation QTL. 3F11-C1 had a very high average maximum F statistic of 200.88 and gave an F statistic calculated from data on all informative individuals of 11.74, though the P' value associated with it, 0.16, is not significant. More proximally, H135 and the closely linked marker H095 appear to define a QTL, which is termed Pcen2R (for P . cynomolgi C eylon en capsulation, chromosome arm 2R). These two markers are the same markers most closely associated with Pen3, a minor QTL for P. cynomolgi B encapsulation. H095 exhibited the highest average maximum F statistic of this data set, 287.99, with an overall maximum of 12.70, the highest of any marker on chromosome 2. However these overall maximum F statistics were lower than similar statistics associated with many chromosome 3 loci (Table 5). Probability of a QTL for P. cynomolgi Ceylon encapsulation on chromosome 2. Conventions are as for Table 3. Underlined markers H175 and H135 indicate maximum LOD scores for Pen1 and Pen3 respectively . Cytogenetic map positions have been used to order loci on 2L where possible. Cytogenetic and genetic map positions are derived from [14, 44–46] and unpublished. Cytogenetic locations were further confirmed by comparison to the current scaffolds of the A. gambiae genome (GenBank accessions AAAB01000001–AAAB01008987). Where the precise location of a marker is not known, its cytogenetic location is shown as the range covered by the corresponding scaffold. Probability of a QTL for P. cynomolgi Ceylon encapsulation on chromosome 3. There are at least two encapsulation QTLs on chromosome 3 (Table 5). Markers H555/H158 define a novel QTL in the central region of 3R, in division 32 or 33 that we have named Pcen3R. Marker 3A2-29 (3L, 41A) defines another QTL on 3L, Pcen3L, which covers the region spanned by divisions 39 – 43. This QTL may explain the relatively high F statistics exhibited for markers H750/H127 in division 39 to H758 in division 43B. It should be noted that H758 is the marker most closely associated with Pen2 and that marker 3A2-29 was not available at the time of the P. cynomolgi B encapsulation studies. When the complete set of progeny was analyzed as a whole, the QTLs on 2R, 3R and 3L explained 13%, 16% and 26% of the refractoriness to P. cynomolgi Ceylon, respectively. Similar results were obtained when only all the families except 8-6 (which fed on a different monkey with different parasite level) were analyzed (data not shown). The refractory and susceptible lines were not highly inbred except for malaria refractoriness or susceptibility and In(2L)+ a (see Methods). This posed a significant challenge to determining the parental origin of alleles at some loci, in some families. In these cases, the phase information of each allele was predicted using a maximum likelihood method. When a Hidden Markov Model was used to determine the number of QTLs based on the derived phase information, it yielded similar results with two QTLs on the third chromosome and one on the second chromosome. These QTLs were linked with the same marker loci as those identified using single locus linear regression analysis (data not shown, S.W and H. Z, unpublished). F statistics were also calculated for each marker within each individual F2 family. The results for all significant QTLs and markers associated with high F statistics in any family are presented in Table 6. Data for H175, the marker closest to Pen1, are included for comparison. There appeared to be considerable F2 family specificity as to which QTLs contributed to refractoriness. Much of the H095 F statistic was due to family 8-4. F statistics for markers associated with significant QTL loci within each individual family. Pcen2R explained the majority of the encapsulation phenotype in family 8-4, less of the phenotype in family 8-6, very little in family 13-4 and contributed marginally to the phenotype in the other three families. Pcen3R appeared to be most important in determining refractoriness in family 8-6 and less important in families 10-1 and 12-1. Pcen3L on the other hand, appeared to be the major determinant of refractoriness in families 10-1 and 12-1. It probably played a minor role in the other families. Melanotic encapsulation of P. cynomolgi Ceylon parasites is controlled by incompletely recessive alleles in A. gambiae L3-5. Similar results were obtained in previous analysis of the original R and S strains with this parasite [12, 23]. Refractoriness of L3-5 to P. cynomolgi Ceylon is shown here to be controlled by at least three quantitative trait loci that we have named Pcen2R, 3R and 3L. Two of the QTLs (Pcen2R and Pcen3L) are located near Pen3 and Pen2 respectively, previously identified as minor QTLs involved in the encapsulation response against P. cynomolgi B. These loci may actually be Pen2 and Pen3. A third QTL, Pcen3R, is most closely associated with microsatellite locus H158. This QTL, therefore, is located in the central region of chromosome 3R, in or near division 32 or 33. This is a novel QTL. A nearby locus, H555, was associated with a local peak in LOD score in the P. cynomolgi B studies . However, in that analysis, this peak in LOD score did not appear as a QTL separate from Pen2. The previously identified major QTL for encapsulation of P. cynomolgi B, Pen1, contributed little to the encapsulation of P. cynomolgi Ceylon. Thus, it appears that different genetic loci may be involved in responses to infections by different malaria parasites or, perhaps more precisely, may make malaria species-dependent contributions to the genetic variance in encapsulation. Initial studies of A. gambiae refractoriness to P. cynomolgi Ceylon used non-homosequential mosquito strains in which a major difference between the refractory and susceptible strains was the absence or presence of inversion 2La. This inversion encompasses polytene chromosome divisions 23 through 26. It was absent in the refractory strain and fixed in the counter-selected susceptible one. Those studies suggested that melanotic encapsulation of this parasite was controlled by a largely recessive allele at one locus, Pif-C . This locus assorted independently from Pif-B, a major locus for encapsulation of P. cynomolgi B that appeared to be tightly associated the 2L+ a chromosomal arrangement [11–13]. Vernick et al. also found that a refractory allele at Pif-B acted as a dominant enhancer of expressivity of the refractoriness to P. cynomolgi Ceylon. A later study using the same R strain and a backcross strategy ensuring that each offspring received at least one refractory allele of Pif-B showed that the refractory phenotype is controlled by at least two, largely recessive loci on chromosome 3 . One of these loci appeared linked to Dox-A2 (3R; 33B). Additional analysis of those data suggests that this locus maps approximately 32 cM from Dox-A2. (P. Romans, unpublished). Therefore this locus is expected to be located extremely distally on chromosome 3R, or else to be tightly linked to the centromere on 3R or 3L. The other locus or loci assorted independently of Dox-A2 but did not assort independently of the Dox-A2 linked refractoriness locus. It was not mapped further because of lack of genetic markers. This study provided strong evidence for variable penetrance and expressivity of refractory alleles at the Dox-A2 linked locus. As indicated by Romans et al. , this locus was more completely expressive when the geometric mean of the parasite load was 178 oocysts per midgut, rather than when it was 28. Since the infection intensities in the present study were similar (geometric mean 22.96, average 39.04 ± SD 36.14) to this lower number, it is possible that the Dox-A2 linked locus could have escaped detection even though most of the third chromosome was subjected to QTL analysis. Nevertheless, the 3A2-29 QTL in proximal 3L maps at the appropriate distance from Dox-A2 to be the Dox-A2-linked gene. Further, it is linked to H758 in division 43, a marker that would assort independently of Dox-A2. Therefore, if H758 is not part of the QTL associated with marker 3A2-29, but is a separate QTL, markers 3A2-29 and H758 could define the loci inferred in the previous study. Our observation that different genes may be responsible for encapsulation of different parasite species raises the possibility that different QTL(s) might be required for melanotic encapsulation of human malaria parasites, such Plasmodium falciparum. The previous selected refractory strain encapsulated P. falciparum isolates from Africa less effectively . Whether refractoriness to P. falciparum is dominant or recessive has not been determined for the previous selected or the L3-5 refractory strain of A. gambiae. Our observation that different genes may be responsible for encapsulation of different parasite species is not unique. In Drosophila melanogaster, a strain that encapsulates eggs of the parasitic wasp Leptopilina boulardi L104, a Congolese strain, is susceptible to parasitism by L. boulardi G317 from Tunisia and by L. heterotoma [25–28]. Further, genetic mapping experiments have shown that the encapsulation responses to L. boulardi and Asobara tabida are controlled by single dominant, but different loci. The locus for L. boulardi encapsulation, Rlb, maps to chromosome 2 at approximately 86.7 cM, in the region 55E3 – E6;F3 on the polytene map [27, 29, 30]. Rat, the locus for A. tabida encapsulation, also maps to chromosome 2R, but at 51.3 cM [26, 30]. The identities of these genes have not yet been determined. Benassi et al.,  have suggested that the products of these loci should be involved in parasitoid recognition. In the G3 parental A. gambiae strain from which the previous and current inbred refractory strains were derived, >50% of females encapsulate P. cynomolgi B, though only 1 – 3 % of females encapsulate P. cynomolgi Ceylon. Recently, field-caught A. gambiae sensu lato mosquitoes from Tanzania were tested for their ability to melanize P. falciparum and CM Sephadex C-25 beads . While fewer than 1% of these mosquitoes were able to encapsulate P. falciparum oocysts, 90% melanized the beads. Even though these results with a natural population of mosquitoes could be confounded by species, age, nutritional and reproductive status , they are intriguingly similar to results obtained with G3. It is possible that genetic polymorphism in the encapsulation response may be maintained by selection in natural populations. The identities of the genes contributing to malaria refractoriness in A. gambiae are currently unknown. Both susceptible and refractory strains deposit melanin in egg chorions and in the cuticles of larvae and adults. Thus it is likely that refractoriness loci encode variant molecules that somehow expose parasites as foreign, or directly affect the signaling pathways involved in activation of the phenoloxidase cascade. Encapsulation occurs just as ookinetes penetrate through the basal labyrinth of the midgut, contact the basal lamina and become exposed to the contents of the hemocoel [8–10]. It is also possible that defects in the basal lamina could be responsible for exposing parasites to soluble receptors and components of the phenoloxidase cascade. It is quite possible that soluble receptors are involved in parasite recognition and initiation of encapsulation. Paskewitz and Riehl  showed that if Sephadex CM C-25 beads had been exposed first to hemolymph from susceptible A. gambiae 4Arr, they could not subsequently be encapsulated by refractory L3-5 mosquitoes. This result could indicate that the receptors are soluble, although other interpretations are possible. L3-5 refractory mosquitoes appear somewhat darker than 4Arr susceptible ones at all stages beyond L2. Mortality associated with molting from L3 to L4, from L4 to pupa and from pupa to adult is characterized by extreme melanization in the L3-5 strain (P. Romans and C. Brotherston, unpublished). It is unlikely that this difference is due to phenoloxidase enzymes themselves: Brey et al. showed that the original refractory line of A. gambiae and its G3 parent did not differ significantly in phenoloxidase activity. Thus it is also possible that some refractoriness loci encode proteins involved in regulating activation of the phenoloxidase cascade, putting it on a sensitive trigger downstream of any receptor, or that they encode enzymes involved in production of phenoloxidase substrates. Mosquitoes and parasites were maintained at the Centers for Diseases Control and Prevention, Atlanta GA as described previously [35, 36]. The derivation of the A. gambiae malaria refractory L3-5 and malaria susceptible 4Arr strains used in these crosses is given by [14, 37]. Reciprocal crosses between L3-5 and 4Arr were carried out en mass. F1 offspring of each reciprocal cross were sib-mated and females were then allowed to oviposit individually in order to establish F2 families of mosquitoes. F2 females were then allowed to feed on rhesus monkeys infected with P. cynomolgi Ceylon. These infections were carried out under the approved protocol 676-COL-MON-CH. Midguts were dissected from F2 female mosquitoes 8 – 10 days post-blood meal and stained with 2% mercurochrome (Sigma, St Louis, USA). The numbers of normal and encapsulated oocysts on each midgut were determined under a microscope . Genomic DNA extraction and genotyping of A. gambiae were carried out as described [14, 38]. Most of the microsatellite marker alleles were scored using an ALFexpress DNA sequencer (Amersham Biosciences, Piscataway, NJ) with Cy-5 labeled primers from Sigma Genosys (The Woodlands, TX), Genset (La Jolla, CA), or Integrated DNA Technologies (Coralville, IA). Some markers were scored using 32P-end-labeled primers as described . The previously described markers we employed were H145, H503, H036, H053, H711 and H678 for the X chromosome; H682, H784b, H417, H290, H175, H197, H187, H799, H095, H135, H770, H772, H603, H819, H802, H117, and R007 for chromosome 2;H776, H249, H525, H555, H158, H750, H127, H577, H758, H753, and H544 for chromosome 3[38, 40]. New primer pairs designed for R007 and H249 are listed in Table 1. Additional new microsatellite markers and primer pairs designed for this study are also described in Table 1. With one exception these markers were identified among A. gambiae PEST strain bacterial artificial chromosome clones (BACs) from the Notre Dame-1 library (Collins et al., unpublished), referred to as ND-1 by , either from end sequences available at Genoscope http://www.cns.fr/externe/English/Projets/Resultats/rapport.html or by screening Hin dIII or Eco RI subclones of BACs (that have been mapped to the chromosome 3 by in situ hybridization) with 32P-end labeled d(GT)15 and d(CT)15. The Ddc microsatellite was deduced from G3 sequence, GenBank # AF063021. Genotypes of the F1 female parents and their F2 female progeny were determined. Both parental strains were polymorphic at many microsatellite loci, except for those on the X chromosome. This led to different numbers of alleles being found at different loci. Interval mapping  was not used for linkage mapping because the statistical analysis requires knowledge of the cis- or trans-relationships between alleles at different loci, and this could not always be determined. Encapsulation phenotypes were tested for statistical association with genotypes of the marker loci within families and for the combined informative data. A single locus association test was performed by fitting a linear regression between the trait value (fraction of oocysts encapsulated) and the genotype at each locus within a family. The significance of each F statistic was established by calculating the proportion of 1000 permutation samples exhibiting an F statistic as large as or larger than the F statistic determined from the observed data both before and after Bonferroni correction. The contribution of a given QTL to the genetic variance was estimated by R2 . We thank Frank Collins and Anton Cornel for provision of cytogenetically mapped BAC clones from the Notre Dame-1 library. We also thank JoAnn Sullivan for excellent technical support and Helen Rodd for additional statistical analysis. This work was supported by NIH grant AI43053 and an award from the Burroughs Wellcome Fund to L.Z. C.L. was supported in part by a grant (Project 990478) from UNPD/World Bank/WHO Special Programme for Research and Training in Tropical Diseases (TDR). Additional support was provided by an operating grant to P.R. from the Natural Sciences and Engineering Research Council of Canada. MQB performed genetic crosses and infection studies. Additional genetic markers were developed by PR, CL and LZ. LZ and CL performed genotyping experiments. Statistical analyses were performed by SW, HZ. Writing was carried out primarily by PR and LZ.